This year, Boulder County spent almost $600,000 purchasing conservation easements. The county has spent more than $23 million over the past decade and around $66 million since the conservation easement program began. Meanwhile, county commissioners are considering a proposal that threatens to devalue all those easements—perhaps even render them worthless. Near the intersection of Highway 36 and Boulder County Road 71N two miles northwest of Lyons is a 1,500-acre property that is under conservation easement (Boulder County staff memo). It is a beautiful piece of foothills land, and it’s one of the largest parcels under conservation easement in the county. It provides great wildlife habitat. Deer and elk herds regularly pass through. Elk bugle there every fall. Bobcats and coyotes roam the property, and mountain lions and bears occasionally make an appearance. The land is uninhabited, it’s quiet, and at night it’s completely dark. 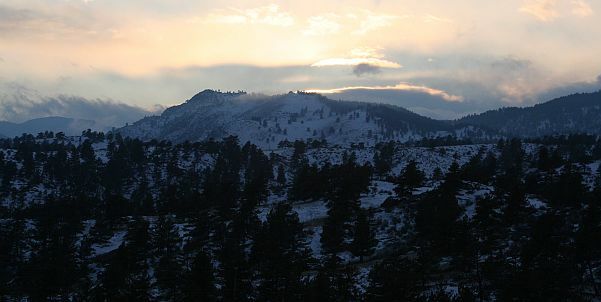 For five successive years in the 1990s, Boulder County bought a series of five conservation easements on this property. Total taxpayer spending on the easements was $1.5 million. Neighbors of the property who knew the landowner at the time say her primary goal was to prohibit any and all residential development in order to preserve the land for wildlife. For the past 15 years, that goal has been accomplished. Now it is at risk. Sisk conservation easement (foreground) from Blue Mountain Road. Photo by the author. Someone else now owns the property, and this week county commissioners are considering rewriting the five easements so that they become one easement—one easement that allows the landowner to build a 6,000-square-foot house on the property. Boulder County Parks and Open Space has offered two primary explanations for the county’s consideration of this change. 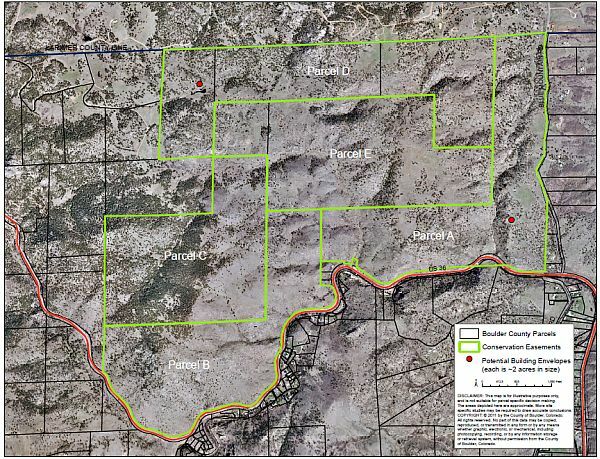 One is that if the current owner wanted to, he could sell each of the five easement properties to different individuals, and “Boulder County staff is concerned about the potential impacts that separating the property into five pieces might have on the habitat the property provides for wildlife.” The current conservation easements don’t regulate fencing on the properties, but the new, consolidated easement wouldn’t regulate fencing either. How, then, would wildlife be impacted if the conservation easement land were owned by five different people? Why would elk care who owns the land they’re grazing? The other explanation the county has tendered for rewriting the conservation easements is that the landowner’s lawyer claims the easements are ambiguous and could be interpreted as allowing the landowner to build a separate house on each of the five parcels. I’ve read the contracts, and they expressly prohibit residential construction—naming as a prohibited use of the property “the construction, reconstruction, or replacement of any structures…” There is a little more legalese to the prohibition, but the wording is not ambiguous. Perhaps the county feels it will avoid a lawsuit, saving taxpayers money, if it simply rewrites the easement now. But what’s to stop the current or future owners of this property from suing (or threatening to sue) the next time they want a change to the easement? How can taxpayers have any confidence that the county will work more vigorously to uphold the new conservation easement than it’s to working to uphold the current set of easements? What’s going on near Lyons has ramifications for conservation easements throughout Boulder County. After all, what does a conservation easement buy for taxpayers? It doesn’t provide ownership rights in the property. It doesn’t give taxpayers the right to hike or bike on the property, or to use it in any way whatsoever. We have no more right to step foot on this land than on any other private property in the county. A conservation easement is nothing more than a contract prohibiting certain uses of a piece of land by the landowner. If the county is willing to rewrite that contract to remove those prohibitions just because the landowner asks it to, the contract has no teeth. Does the conservation easement, then, have any value at all? I’m outraged that the county is considering allowing residential construction on this land. I live near the property and would love to see it remain pristine. But I’m more upset as a Boulder County taxpayer. The county paid $1.5 million to prevent residential construction here, and now—for no significant benefit to taxpayers or wildlife—the county is considering rewriting the easement to allow residential construction. What message would that send taxpayers, whose money the county continues to pour into new conservation easements every year? Worse, what kind of precedent would it set—not just for this agreement, but for all the other conservation easements that the county has invested so much money in? What’s to prevent every other property owner with a Boulder County conservation easement from hiring a lawyer and petitioning county commissioners to make changes? Would the county fight harder to preserve smaller easements than to preserve 1,500 acres in which it’s already invested $1.5 million? And for owners of large properties who are currently considering selling the county a conservation easement, shouldn’t a major revision in the terms of the Lyons-area agreement be reason to pause? The county seems to be saying that regardless of what’s written into a conservation easement contract today, commissioners might well revoke its most important provisions once ownership of the property changes hands. All the owner has to do is ask in the right way. I see this proposal as a threat to the value of all the easements my (and your) tax money has paid for over the years. If it strikes you the same way, please join me at the hearing to discuss the issue on Tuesday morning, December 20, at 11 a.m. in the Commissioners’ Hearing Room, Third Floor, Boulder County Courthouse, 1325 Pearl Street, on the Pearl Street Mall in Boulder. Previous Topic: Intelligent Utility | SmartGridCity: Did Xcel get results? Update: At the hearing today, the county commissioners decided to wait to make a decision until they can confer with legal counsel after the first of the year.